How an Austin-based team of bicyclists is delivering green goods to local farms and gardens, and diverting scraps from the landfill. Imagine a food system that is capable of sustaining itself—and the people it supports—indefinitely. That’s what Dustin Fedako, founder and CEO of the Compost Pedallers, hopes to build in Austin, Texas. 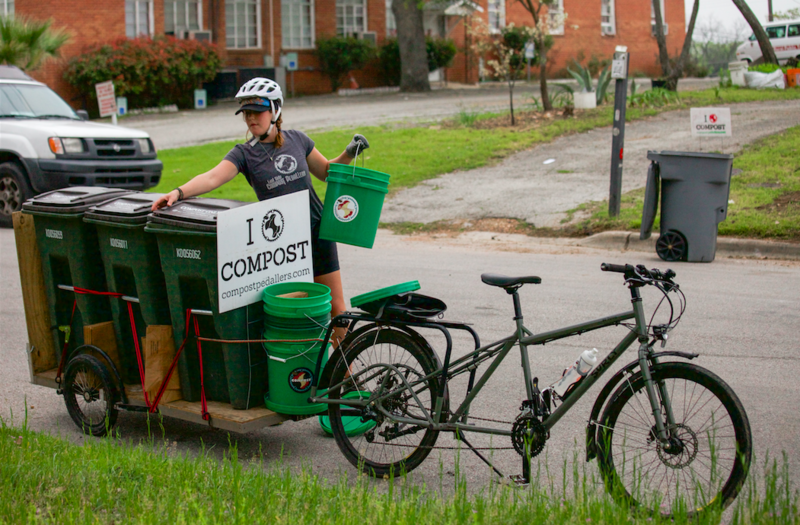 As the company’s name implies, the Compost Pedallers sends a team of bicyclists around to homes and businesses, where they collect kitchen and yard scraps and pedal them directly to Austin urban farms and community gardens. Over the past three years, using only bikes, Fedako says the company has diverted half a million pounds of waste from landfills and donated $13,000 worth of natural fertilizers to local growers. Compost adds organic matter to soil, stores carbon, improves plant growth, conserves water, reduces reliance on chemical pesticides and fertilizers, and helps prevent nutrient runoff and soil erosion. 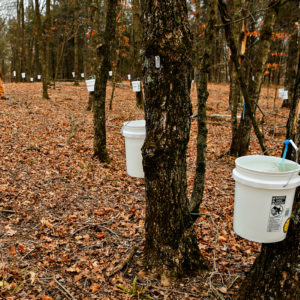 It also keeps organic materials—a valuable resource—out of the landfill, where they would otherwise release methane, a powerful greenhouse gas. As Fedako sees it, composting can also build interconnected, resilient local communities. The interconnection between all of these parts of Austin’s food system often goes beyond the compost itself. “There’s an amazing magic that happens as a byproduct of these connections,” Fedako explains. One local restaurant now buys tomatoes from the farm that receives their waste. Another recently made an in-kind donation to the school garden that receives theirs. When people hear about how much human power the Compost Pedallers spend transporting compost in a relatively old-fashioned way, they often think it’s a little out there. Although Fedako understands that initial reaction, he believes that the way most cities currently manage their organic waste streams is even crazier. 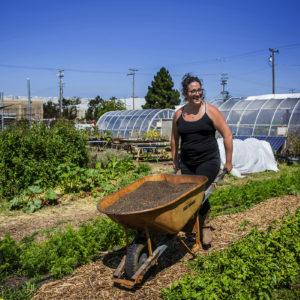 Community composting—the term that has evolved for the type of work the Compost Pedallers do—has gained traction in recent years. When Fedako explained his project to attendees at the U.S. Composting Council’s national conference for the first time three years ago, he says they acted like he was speaking another language. This year, there is $35,000 available in grant funding to bring 50 community composters to the conference, which will be held in Austin in January. Fedako will be speaking on a few panels and talking with community composters from all over the country about how they can pool their experiences and resources to keep the movement going. Currently, the Compost Pedallers have more demand than they can meet. With over 1,400 people in surrounding neighborhoods on their waitlist, and emails in from people all over the world who are interested in applying the model in their communities, Fedako and his team feel a responsibility not only to continue to grow locally in Austin, but also to help the community composting movement grow. One of the big challenges the company faces is the fact that the pedallers’ work has been limited to 25 hours a week because the job is so strenuous. Fedako and his team have worked with bike manufacturers around the country to design electric-assist vehicles which will make the pedaling easier and allow pedallers to reach places that were previously inaccessible due to hilly terrain. 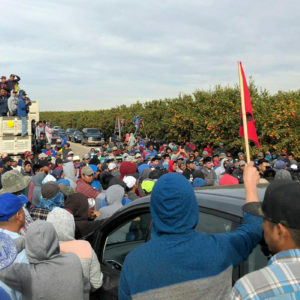 The hope, he says, is also to make the job more accessible to a larger variety of people and create a safer work environment. With the goal of doubling their service area and moving one million pounds of waste in 2016, the Compost Pedallers started an IndieGoGo campaign last month (deadline December 10). Every $10,000 they raise goes toward a new operational unit, complete with an electric bike, a custom trailer, bins, and containers. Each station will be set up to divert 200,000 pounds away from landfills and into local soil annually. I am so very happy to see this article! I have been thinking about how I can get people to compost their kitchen scraps and then be provided with soil for their houseplants, etc. I've used kitty litter containers with the snap lids to hold my scraps and then I compost them myself, but I've been thinking about going to a senior apartment complex to see how many folks there would like to contribute. But I'm old now myself and have little to no energy to do the job. Do you have any registry of groups in different areas of the country? I'd be interested in SW Michigan groups. We MUST change the world! !